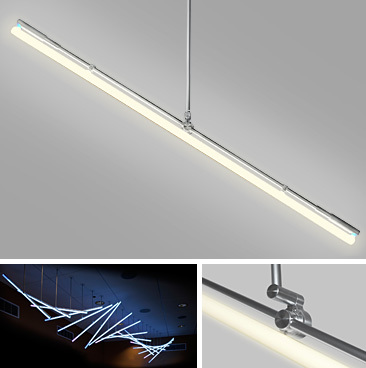 Streamlites Cold Cathode, AXXS offers a creative way to illuminate an interior space with cold cathode lamps. The AXXS hub allows lamps to be rotated to a fixed position at multiple angles for one of a kind installations. ACL's new threaded eCVR with no visible fasteners make this luminaire sleek and minimalistic, giving the impression of light floating in space. AXXS Cold Cathode lamps have end to end illumination and are available in several lengths and colors. This uminaire offers unlimited possibilities that are both classic and timeless. ©2012 Architectural Cathode Lighting Inc.